Quotidian Theatre provides a look into the old south and all its dysfunction with a quiet production of Horton Foote's The Roads to Home. 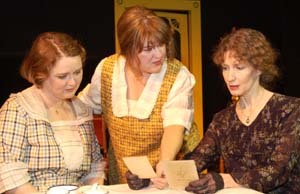 Essentially three one act plays that tell the story of a trio of Texan women from the spring of 1924 until the spring of 1928, The Roads To Home deals with issues of infidelity, mental illness and marital boredom. At times interesting and quite insightful, the play is marred by its slow pace and meandering style of writing. In addition, the build up of characters in Acts One and Two (both of which take place in 1924) quietly fade away as Act Three moves into 1928 and concentrates on one of the least compelling of the three main characters. It makes for an odd, disjointed evening of theatre that is not entirely satisfying. Set in Texas just prior to the Great Depression, Foote provides us with a peek into the lives of his three women -- Mabel Votaugh, Vonnie Hayhurst and Annie Gayle Long. Mabel is a spirited woman who is married to the uncommunicative Jack. Vonnie is a woman far from home who is desperately in love with her husband Eddie. And poor Annie is a child of wealth and privilege who is slowly sinking into insanity and incarceration at a mental asylum. Mr. Foote tries to help us see the quiet workings of an individual's soul when faced with life's difficulties and obstacles. For Mabel its the boredom of marriage which she fills with excitement by gossiping about other people's lives. For Vonnie it's facing the fact that her husband doesn't love her any more and wants a divorce. And for Annie it's the dawning realization that her friends, husband and mother have abandoned her as her mental health deteriorates. Quotidian Theatre Company does a terrific job of casting and producing the play in its small home at Bethesda's Writer's Center. Using a simple set that is at first the home of Jack and Mabel and then the garden of the asylum, director Jack Sbarbori pulls compelling performances out of his cast that highlight the humor in the script and the pathos of the situations. The entire piece takes on a lively charm. The choice to play entire Depression Era songs prior to the start of each act and to require a complete set change for Act Three can be viewed as slowing down an already languid piece or as adding atmosphere to a production that centers on a slower paced time in the history of the country. Within the cast, Audrey Cefaly as Mabel Votaugh and Ted Schneider as her husband Jack provide a humor filled glimpse into a marriage built on love and annoyance. Mabel realizes Jack is a good man; she just wishes he wouldn't fall asleep every night while listening to the phonograph and wasn't so set in his ways. Erika Imhoof and Matt Jordan as Vonnie and Eddie Hayhurst are the disintegrating lovers who must come to terms with their lives. Each does a good job of providing balance to their roles as the hemorrhaging couple. Stephanie Mumford as the delusional Annie Gayle Long is at times funny and sad, while Doug Prouty brings a human face to her distraught husband Mr. Long. In the roles of the other occupants of the mental asylum, Matt Wilschke seems to have the easiest role -- he never speaks -- but his constant stare and impassive expression are actually a challenge to maintain. John Decker's Greene Hamilton comes across as a nervous and anxious man who is unable to handle life outside the asylum's walls. And Steve LaRocque as Cecil Henry provides perhaps the tautest moment of the play when you realize his genial affability may be hiding a murderer. If you want a quiet, charming production and don't mind the inconsistent aspects of the piece then Quotidian's The Roads To Home will suit you very well.